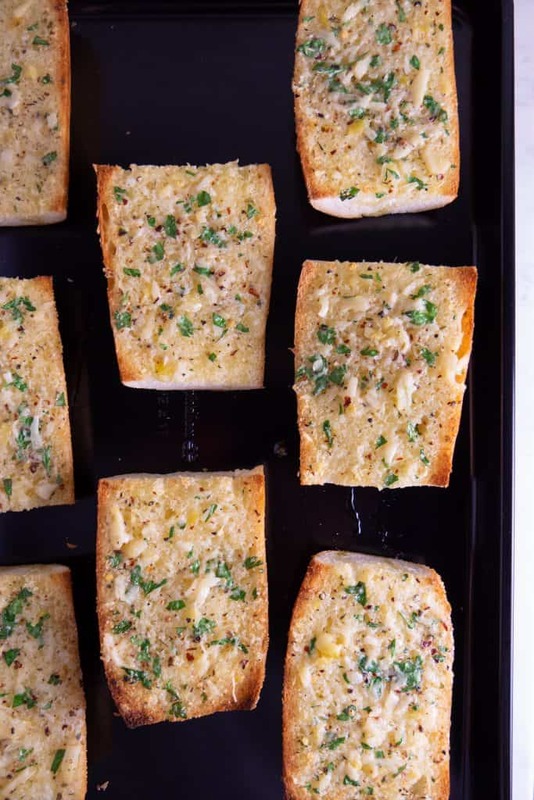 This garlic bread is a staple in my household because it’s easy to make and it’s the perfect sidekick to my Italian dishes. I even use it when making chicken parmesan sandwiches or meatball subs (#drool). I start with roasting the garlic. I peel away some of the outside skin and I cut 1/4th off the top of the garlic, exposing the cloves (I use a small pairing knife to get the little guys on the side). Place them in foil, drown them in olive oil, add fresh black pepper and then close up the foil. 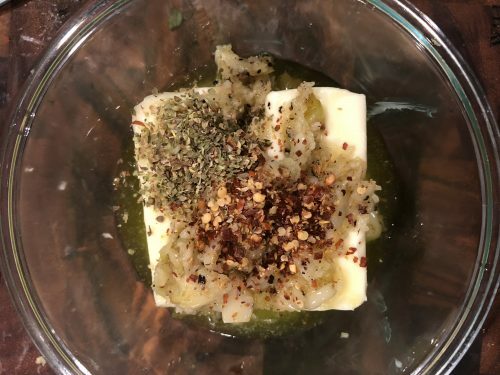 So you’re basically making an olive oil steam bath for the garlic. Not all garlic is created equal, so you have to take into consideration size of the cloves, how fresh the garlic is, etc. so I usually start with putting them in the oven for 20 minutes and then I go from there. 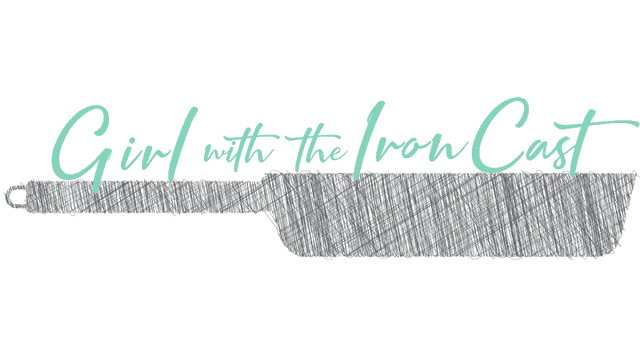 You’re looking for a golden brown color and easy to pierce with a fork. Once they are done roasting (and your house smells amazing), careful they’re hot! I typically use tong’s to squeeze the roasted garlic out of the skin (they should easily squeeze out). Now its time to add all the good stuff, the herbs, red pepper flakes, and parmesan. 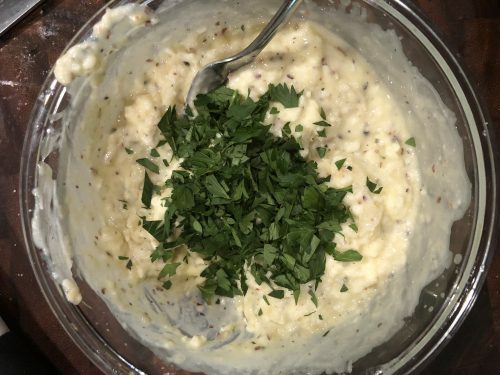 Mash it all together with a fork and then you want to finish it off with fresh parsley & a dash more olive oil. 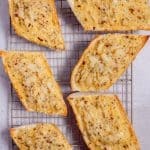 Slather that deliciousness on the bread and put it on low broil until the sides begin to brown. What comes out of the oven? 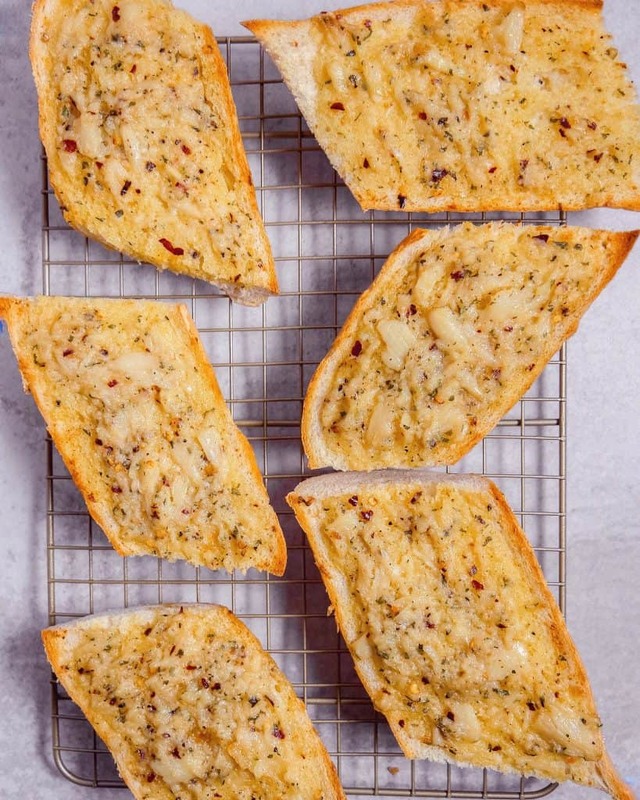 Warm and crispy garlic bread that is ready to compliment your meal and have your guests fighting over the last piece. Cut 1/4 of the head of garlic on top to expose cloves slightly and peel some of the excess clove skin off. 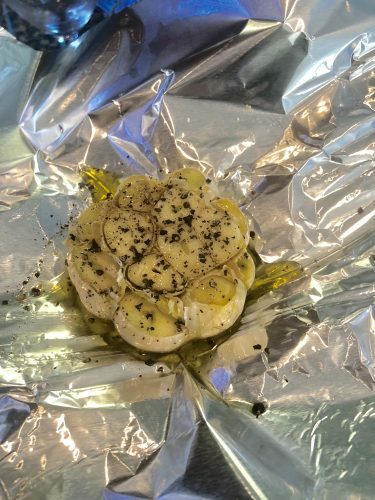 Using a sheet of foil, place garlic head inside, pour 1 tbsp of olive oil over the exposed bulbs and season with fresh ground pepper. 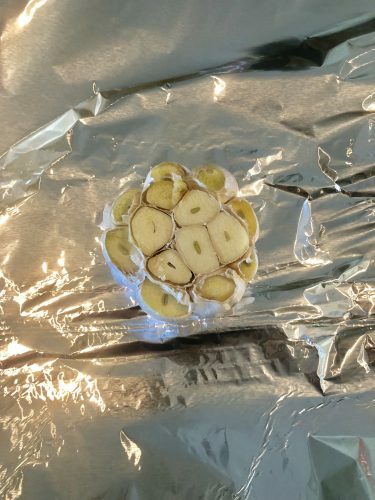 Enclose the garlic in the aluminum foil and place in the oven. Roast for 20-30min until the clove can be easily pierced with a fork and slightly browned. 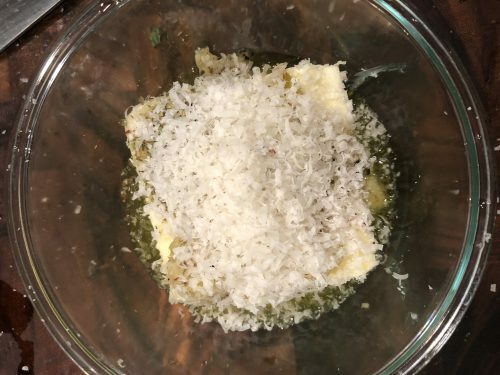 While the garlic roasts, in a small bowl place the butter, oregano, red pepper flakes, parmesan cheese, parsley, and olive oil together. 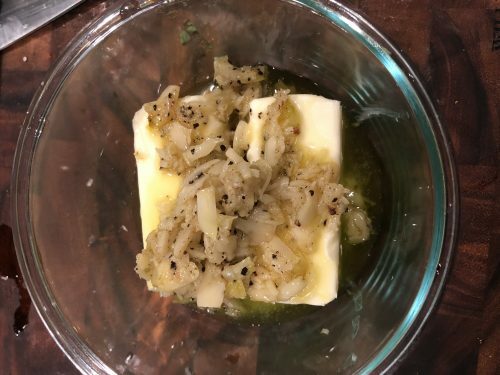 Once the garlic is done roasting, remove from the oven (caution hot) and squeeze the head to remove the garlic cloves into the bowl with the ingredients above. (I use tongs to squeeze the bulbs out since it is hot to handle with your hands). 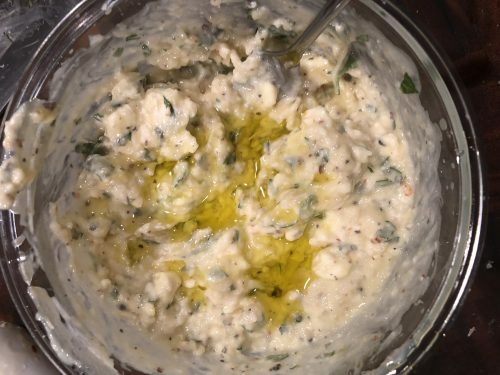 Mix all the ingredients together and spread onto your bread. 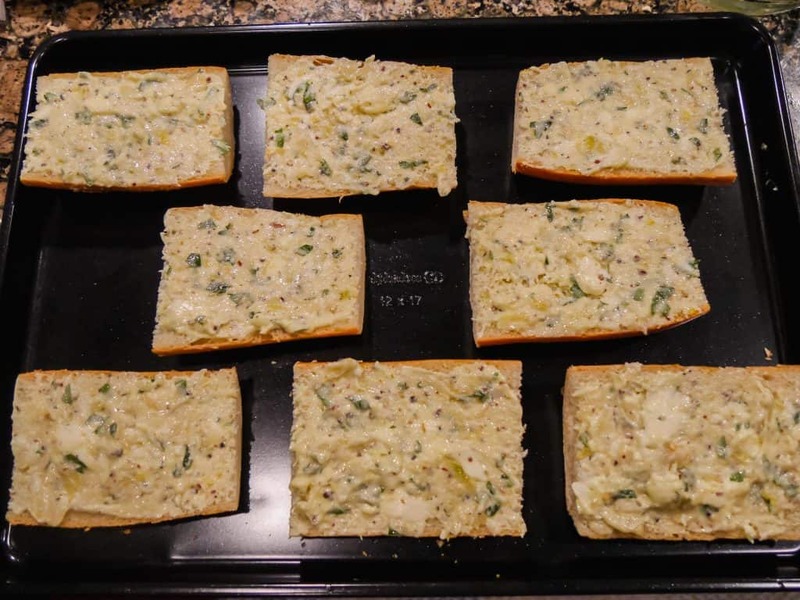 Place bread in the oven on low broil until the edges are crispy, about 5 minutes, or until desired crispiness. 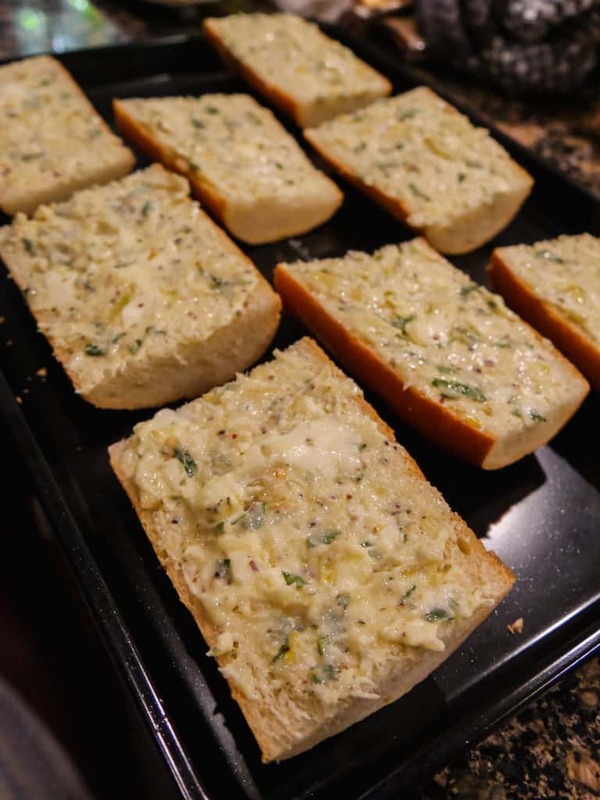 I’ve made this garlic bread for several occasions now and omg it’s so delicious. I loove roasted garlic! Perfect addition to any meal ! !